Few things are as important in life as a well-rounded education. Parents and schools alike are responsible for the significant burden of helping young minds develop. What better way to ensure your child’s future is in good hands than by opting for one of the luxury boarding schools on our list? This choice makes all the difference, inspiring the teenager to nourish lifelong goals or discouraging their interest in a bright future. For those who have the necessary resources, having the best of the best is the only option they would consider. That often means sending a child to a private institution, many of which have quite exorbitant tuition fees. You can find elite boarding schools all around the world, but some would argue that Europe hosts the best of them. The high tuition is a symbol of the boarding schools’ selectiveness, while the children are expected to follow the footsteps of some of the most impressive alumni. A luxurious boarding school promises to provide its students with a valuable experience, exposing them to an excellent education. It’s not unusual for boarding school students to go on to prominent colleges (such as an Ivy League university in the U.S.). Due to the outlandish price that’s often involved, attending boarding school is more often than not a privilege. Below is a list of some of the most prestigious and elitist boarding schools in the world and what makes them special. So why should you send your teenager to an elite boarding school? Isn’t day school or public school just as good? Given that many parents ponder over these questions, we decided to offer you some arguments in favor of boarding schools. The academics, the extracurricular activities, and the athletics are just some advantages to take into consideration. Then, it’s just a matter of working out the details. As a rule of thumb, boarding schools prefer to employ teachers with degrees in their respective subjects. At the same time, many of the experienced teachers that will guide your child’s education also have advanced degrees in their field. The chances of finding passionate teachers who love young people is higher than in the private sector. With discipline being less of a problem in private schools, teachers can focus more on teaching and less on playing cop. Most luxury boarding schools are synonymous with amazing sports facilities. Your child will have an impressive range of sports and teams to choose from – anything from squash to rowing, basketball to volleyball. Equestrian and natatorium facilities are also common. Thanks to their well-equipped fitness facilities, many boarding schools send their varsity teams to regional and international competitions. If your child more artistically inclined? Fear not, as most boarding schools welcome children in their theater, music, dance, fine arts departments and programs. Some of the schools on our list have stunning performing museums and arts centers that your teenager would probably love to attend. Choirs, bands, chamber music, orchestras and jazz ensembles – these are just some of the opportunities for students to use and expand their musical talents. The museum and art galleries existent in many schools provide another artistic enhancement for those inclined. Leaving the home nest is not an easy step. But what if you could ease your kid into college by helping him or her adjust to life without you? Moving in a boarding school seems like a good idea for a lot of parents who want their teenagers to learn about life in a community of peers. It will help them cope with real life – with all its highs and lows – without having to rely on their parents at every step of the way. Meanwhile, you can rest assured that your child is constantly under the caution eye of his teachers and mentors. Boarding school also teaches young people responsibility. Taking many little steps helps them grow and mature – and isn’t that what you want in the end? Boarding school students have to learn to get along with others, as well as be responsible for their actions. The discipline code existent in many of these luxury schools can also straighten out kids and help them become more responsible adults. With 1.24 miles of coastline along Narragansett Bay, Portsmouth Abbey School is a private education facility that houses 70 percent of its students. For those inclined towards a theological education, this Roman Catholic school also provides access to a monastery led by Benedictine monks, on-campus. The Benedictine model of creating a “community life of work and prayer” has been adopted by the school’s ethos, teaching students to find harmony between their academics, social and physical endeavors. Many of the students of Northfield Mount Hermon go on to matriculate to prestigious colleges, such as the NYU, Boston University, or George Washington University. It’s a sign that shows the boarding school’s high standard of education, encouraging for parents seeking assurances. In addition, Northfield Mount Hermon offers students $8.4 million in financial aid, as well as a College Model Academic Program. Most of the 1,565-acre campus is located along the breathtaking Connecticut River. 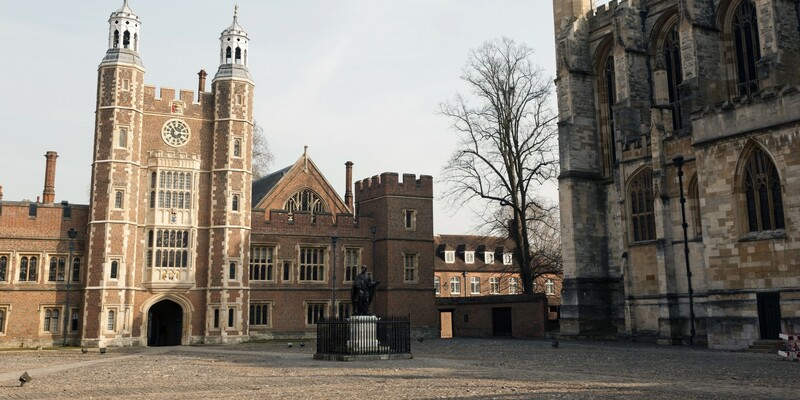 Founded in 1440, Eton College is held in high regard in any discussion about luxury boarding schools. One of the most revered options on our list, Eton College provides a male-only campus for the highest class of socialites. More royal members, politicians, and celebrities have graduated from its esteemed classes than any other boarding school in the world. Author George Orwell, as well as Prince William and Harry have attended Eton. Most of wouldn’t appreciate the northern winters, but not the Gould students. According to them, the cold weather has prompted them to start a cherished tradition of winter sports. Thanks to the close proximity to New England’s amazing ski resorts and mountains, the academy provides its students with a number of competitive and non-competitive winter sports. Snowboarding and alpine skiing competitions are rather common. The first British boarding school located in Switzerland, St. George’s School is situated on a 45,000 square meter estate. It’s more like a vacation location, given its breathtaking views of the Alps and Lake Geneva. Like any other elite boarding school in Switzerland, St. George’s mainly focuses on outdoor sports and activities. Besides academics, of course. Designed by the renowned Olmsted Brothers architectures, the gorgeous Middlesex campus is just miles away from Boston. If you’re looking for a place that balances personal discovery with demanding academics, this is the school for your child. Kevin Systrom, the cofounder of Instagram, is one of the most famed alumni of the Middlesex School. Americans have also opened a boarding school in Switzerland. Leysin American School offers its students an American curriculum, as well as an International Baccalaureate program. Suitable for kids from all around the world, the school conducts amazing educational programs that sends its students in cultural trips in Europe. Proud of its eco-friendly initiatives, the school uses clean, solar energy to equip its dormitories with hot water. Kent School is all about its proud traditions. For instance, 11th-graders (also known as fifth formers) celebrate Rock Day by hiking a mountain to paint their graduation year on a cliff. The campus is amid the Appalachian Mountains, offering students some of the best hiking and biking trails. Few luxury boarding schools have such impressive outdoor education. Students at the Pebble Beach campus have access to a highly selective, co-educational, private system. From preschool through twelfth grade, your child can form educationally while also enjoying the amazing landscapes of Pebble Beach. The boarding school organizes plenty of physical activities, such as mountaineering, rock climbing, ropes courses, and sea kayaking. Have you ever wondered where the rich and royals send their offspring to school? Le Rosey is the answer you’re looking for, a boarding school exclusively for the social elite. Among the most expensive international schools on the globe, Le Rosey makes it worth your money. Sitting on 28 hectares, the campus features 10 tennis courts, several Jacuzzis, and plenty of swimming pools to go around. The school also has a superb sailing center, teaching the young kids how to navigate their own private yachts. Marsha knows a thing or two about life's finer things. She enjoys researching and plotting out her luxury lifestyle should she ever strike it rich. In her spare time, Marsha enjoys traveling to luxury hotels and resorts for the optimal level of pampering.